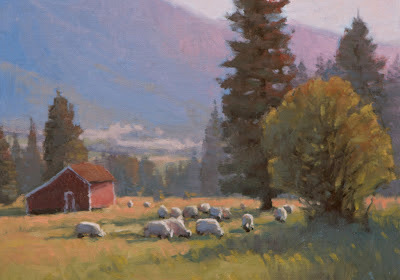 I rushed the composition of this study in an effort to have time to capture the quickly changing light. I'm hoping that my photo reference will be adequate to help recompose it later if I decide to make a painting of the scene. I was standing on the side of the road in some very tall grass; tall enough that the seed tops of the grass tried to repaint my painting for me in the wind. I don't think they liked the composition either. There is also a stream in this scene that I didn't work into it that may be the missing balancing element. The wind last night blew away much of this smoky atmosphere, so it is somewhat clearer today if I decide to paint this evening. Study 10x7", Oil on Linen.